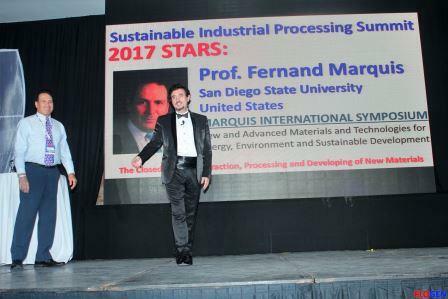 Professor Marquis professional career is truly International and has involved teaching and education, research and development, curriculum development, research training of undergraduate and graduate students, consulting and service to the Profession, Institutions and Society at Large in many Countries and several Continents. He has made significant technical contributions in many areas of Materials Science and Engineering and through his dedication he has inspired and impacted the life of many students". His first refereed publication was entitled "Thermophysical Properties of MnTe", J. Chem. Thermodynamics, 4 (1972). These contributions and their impact have been recognized in the prestigious award of Fellow of the American Society for Metals (FASM), in 2006. The citation reads: "For significant technical contributions in many areas of Materials Science and Engineering and for his dedication to inspiring and impacting the life of many students". Professor Marquis began his professional career at the University of Coimbra, Portugal in the mid 1960s where he graduated with a BS in Chemical Engineering and where he taught Inorganic Chemistry and General Chemistry. He was a Research Assistant at the Danish Atomic Energy Establishment, in Riso Denmark and a Research Assistant at the Kjemisk Institutt, at the University of Oslo, Blindern, Norway. He graduated from the Instituto Superior Tecnico in Lisbon Portugal with a Diploma in Chemical and Industrial Engineering where he become an Assistant Professor and a Research Associate in the Corrosion Group at the Portuguese National Institute for Industrial Research. He was an Academic Visitor at the Imperial College of Science and Technology (now Imperial College of Science Technology and Medicine) were he obtained his Diploma of Imperial College and his PhD both of them in Metallurgical Engineering. He also obtained a PhD degree from the University of Lisbon in Metallurgy and Materials Science and was an Assistant Professor (Professor Auxiliar) at the Faculty of Engineering, at the University of Minho, where he also served has Vice-President of the Engineering Council, and Vice-President of the Center for Research on the Science and Technology of Materials (CCTM). He also served as Head of the Metallurgy and Materials Science Division and was promoted to Associate Professor (Professor Associado) in 1979. He became a Registered Charter Engineer, Council of Engineering Institutions in the United Kingdom (1979), a Registered Professional Chemical Engineer (1979) and Registered Professional Metallurgical Engineer (1979) in Portugal. He was a Visiting Professor and Associate Scientist at the Department of Mechanical and Aerospace Engineering at the University of Delaware, a Visiting Professor at the Department of Applied Mechanics and Engineering Science at the University of California, San Diego (UCSD) and a Visiting Professor at Titanium Metals Corporation of America (TIMET). He taught extensively for 26 years at the Department of Materials and Metallurgical Engineering at the South Dakota School of Mines and Technology and taught also extensively at the Naval Postgraduate School for nine years as a Visiting Professor at the Department of Mechanical and Astronautical Engineering and a Research Professor at the Department of Systems Engineering and at the Wayne E Meyer Institute of Systems Engineering. He is current an Adjunct Professor at the Department of Mechanical Engineering at the San Diego State University (SDSU). Professor Marquis research contributions cover many areas such as: (1)Nanomaterials and Nanotechnology, (2) Shock Synthesis, Combustion Synthesis and Densification of Ceramics, Composites and Intermetallics, (3) Microstructural Design for Strength, Toughness and Fatigue Resistance of Aluminum Based Alloys: 2024, 2124, 5454, 7050, 7150, (4) Development of High Strength Zirconium and Titanium Based Alloys, with focus on Phase Transformations, (5) Development of High Strength Multiphase Stainless Steels and Stainless Composites, with focus on Phase Transformations, (6) High-Strain, High-Strain Rate Deformation Behavior of Ta and Ta-W Based Alloys, (7) Failure Analysis and Mechanisms in Structural Components, (8) Solid State Ionics and Solid State Energy Devices, (9)Corrosion of Zirconium, Copper and Cobalt Based Alloys, (10) Forensics, (11) Airplane and Aerospace Materials and Structures, (12) Creep Behavior of Nickel Based Super Alloys and High Temperature Materials, (13) Renewable and Alternative Energy Systems. He has several patents and patent applications, eleven disclosed inventions of available technologies for licensing and commercialization, over one hundred refereed publications, edited thirteen books and special publications, wrote several book chapters, 33 special reports and four monographs. He supervised over 35 Master and PhD students, delivered over 35 invited and keynote lectures and gave over 90 contributed presentations. He has received many TMS awards and other awards such as FASM, Fellow Royal Microscopical Society, Who's Who in Engineering, Entrepeneurs of America, Faculty Award for Teaching with Technology (Governor of the State of South Dakota) He is an ABET Program Evaluator for Materials Engineering, Metallurgical Engineering and Polymer Engineering. 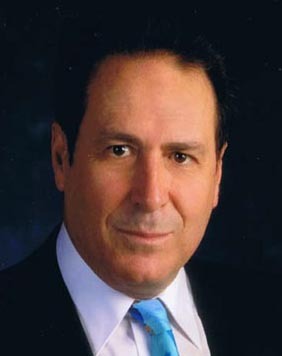 He has been and is a member of many global Professional Societies, Professional Organizations and Advisory Boards, Editorial Boards (such as Portugaliae Physica), Board of Trustees (such as Alpha Sigma Mu) and several Award Committees where he served and continues to serve extensively. He has been engaged in the organization of many International Conferences, Workshops and Symposia in many different global venues. He is a Paul Harris Fellow and a Member of the Rotary International, leaved and worked in several countries and speaks fluently five languages. More recently he has organized very successfully a very large number of International Conferences, Workshops and Symposia under the umbrella of many Societies and Organizations such as Engineering Conferences International and independently in many different global venues. He donated extensively in time and energy during 36 years of Service to TMS and served in many Divisions and Committees such as: Materials Design and Manufacturing Division, Professional Registration Certification, Accreditation, Powder Materials, Mechanical Behavior, Composites and Program Representative. At the Service of TMS he has organized seven (7) International Symposia and was part of the US/ International Organizing Committee for PRICM-6 (Jeju Island, Korea) and PRICM-7(Cairns, Australia), the USA In-Country Technical Representative for PRICM-7 and the Congress Organizing Chair for PRICM-8 (Waikoloa Village, Hawaii, 2013). 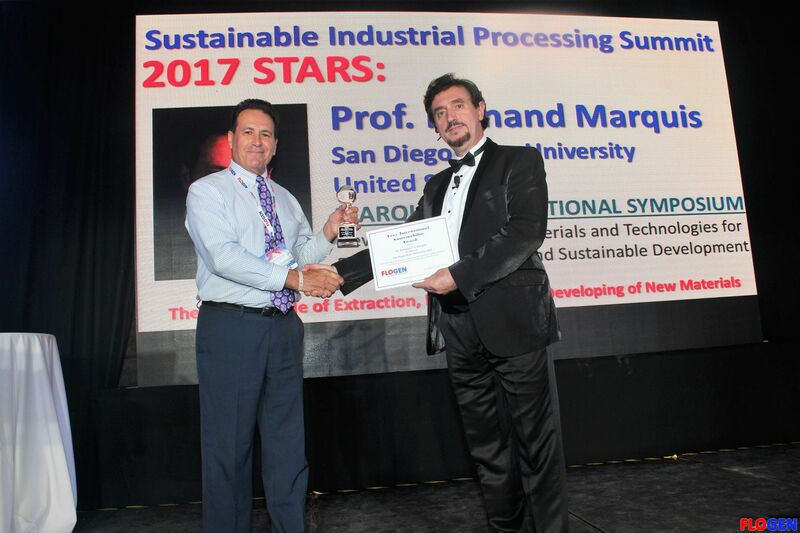 Throughout his professional carrier Prof. Marquis has developed and sustained very strong research programs, and has been a Member of several professional collaborations within the USA and in other countries all over the world. He continues to make significant technical contributions in many areas of Materials Science and Engineering and for his dedication to inspiring and impacting the life of many students". 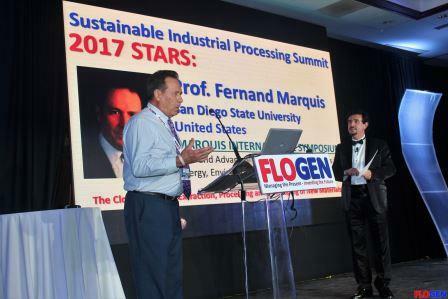 He has been a reviewer for many International Journals such as: Journal of Materials Research, Journal of Material Science and Engineering, Materials Research Forum, Metallurgical Transactions, Journal of Materials, Royal Society of Chemistry, Advanced Materials Forum. In addition, he has served and continues to serve in many Review Panels and has reviewed many research proposals for several Agencies. Consistent with his professional career this symposium focus on New and Advanced Materials and Technologies in Energy, Environment and Sustainable Development. Sustainable development is achieved when the present needs and challenges are met without placing in jeopardy the ability of future generations to meet their own needs and challenges. The technological progress achieved in the last 60 years has been tremendous and the rate of this technological development is expected to continue increasing. In addition, the world population is increasing exponentially and expected to reach 11 billion by 2050. Because most of our resources are limited, this means that we need to achieve more with less. The global energy demand is expected to increase by more than 100% from now to 2050. This considerable increase is expected to occur in parallel to the increase in population and the considerable pursuits to reach higher living standards in the developing countries. The three main fossil fuels: oil, natural gas and coal may not be always available to meet the global demands, and the current available reserves are expected to be depleted well within the next two centuries. In addition, the continuation of associated fossil fuel emissions will not be environmentally accepted, and there is a need to remediate some of the deleterious effects already sustained by the environment. Energy security has become a major and critical issue as fossil fuels are confined to a few areas in the world and their availability is controlled by political, economic and ecological factors. This means that in short term, considerable energy efficiencies and savings must be achieved and alternative and renewable sources of energy must now be developed, in a potential transition to a future potential effective hydrogen based economy. The cleanliness of hydrogen and the efficiency of fuel cells may offer in long term a very potentially attractive and effective replacement for fossil fuels. It has been demonstrated in several domains that Nuclear energy can be harvested in a safe and secure manner and considerable progress has been recently made towards the achievement of these goals. This Symposium focuses on recent advances in Materials and Technologies that have a potential transformative impact towards achieving and enhancing sustainability in all its appertaining domains such as: Transportation, Industry, Power and Electricity, Defense and Environment. A special focus will be given on recent advances in Transformative Materials and Technologies for Renewable and Alternative Energy and the Environment designed to achieve and enhance sustainability. This includes all types of new and advanced materials and technologies such as powder materials, nanomaterials, multifunctional materials and all materials and technologies with enhanced energy performance. In order to enable some of these technologies, it also encompasses and focuses on advanced energy storage and conversion materials and technologies such as batteries, super capacitors, fuel cells and thermoelectrics. In addition, this symposium focuses on the environment dealing with advanced materials and advanced technologies designed to address water purification (chemical and bio) and environment remediation, including soil and waste remediation.